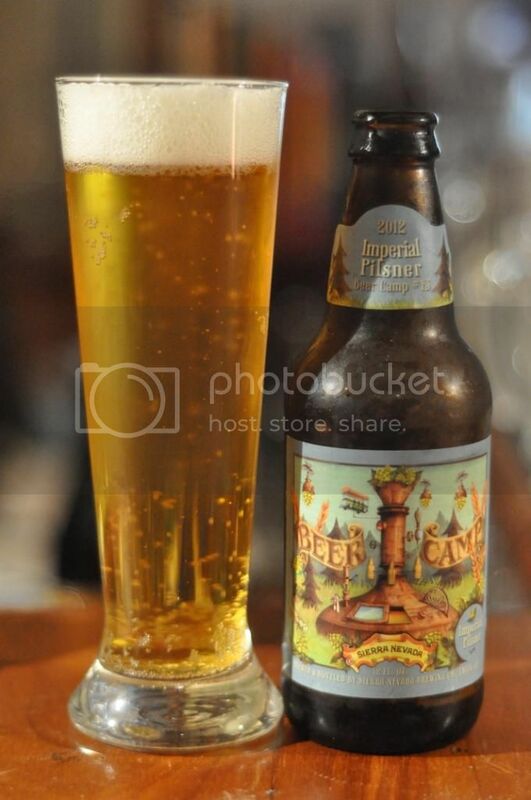 It's that time of year again when Sierra Nevada's Best of Beer Camp is released. After the success of last year there was no question that I would have to try this years! My mate Jack and I sampled these yesterday before our work Christmas party so these reviews are all coming from notes off my phone. 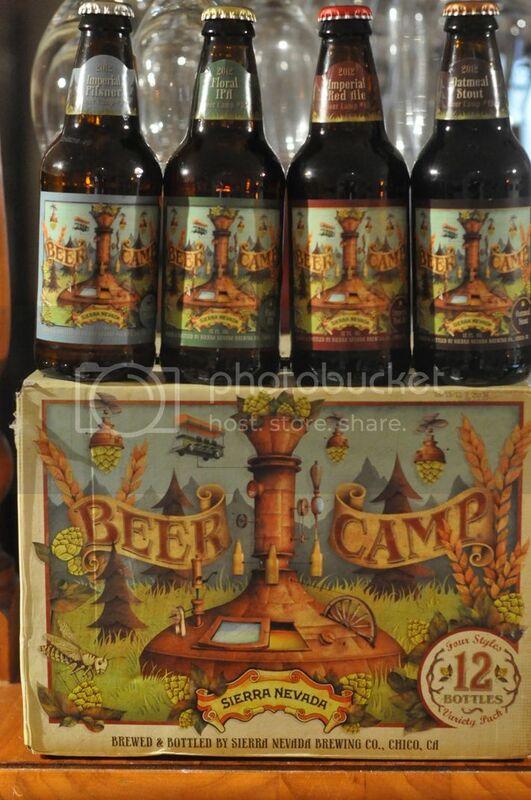 The 2012 Beer Camp selection includes an Imperial Red Ale, an Oatmeal Stout, a Floral IPA and an Imperial Pilsner. I'm expecting alot from these beers after witnessing the quality of last year's selection firsthand. In particular I am looking forward to the Oatmeal Stout, it's a style which I think is under produced however this may be because they are notoriously difficult to make. 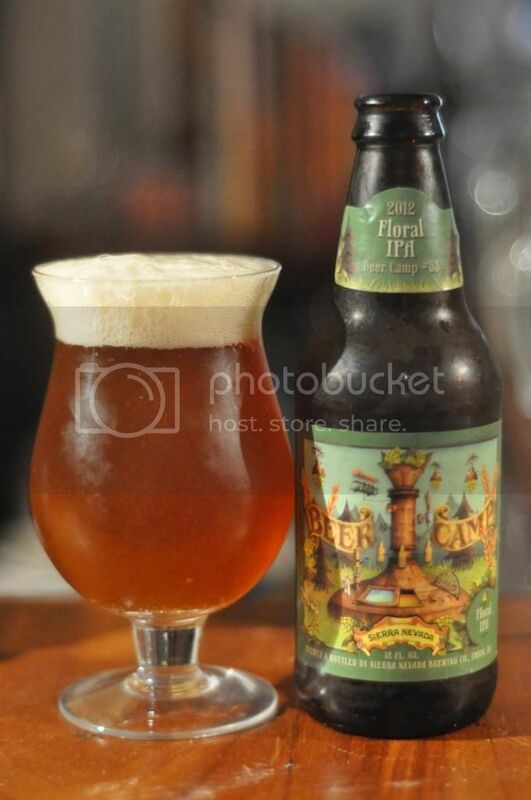 The Floral IPA is an English IPA and I will be interested to see what Sierra Nevada can produce for this style. The Imperial Pilsner will be an interesting beer to try as lagers and normally shunned by the craft beer world. Red Ale's often aren't my thing but I'm approaching it with an open mind. Let's get into them! Yesterday was quite hot so the only logical starting point was the Imperial Pilsner. The pour was excellent, a brilliant golden straw colour with a good sized white head on top. The nose had very strong elements of lemon zest coming from the hops and it seemed to be quite bitter with a very low malt profile. It was a really fresh crisp tasting beer. There was plenty of citrus flavours and the mouthfeel was fantastic with plenty of bubbles on the tongue. The beer had a lovely dry finish and there was plenty of bitterness. It was the perfect beer to have after a hot day at work. It's a pilsner I would like to see more of in the future. We decided to follow up the Pilsner with the Floral IPA. The pour was again excellent with a deep orange/copper colour with a good sized creamy head. The nose is incredibly aromatic, with (unsurprisingly) floral hops taking centre stage. It's a very enticing aroma. When you first taste this beer it's somewhat hard to see where the English IPA style comes from. It's incredibly bitter and in your face but the beer mellows a bit as you continue drinking and it becomes quite a nice IPA. There are certainly better examples of the style out there but you could do worse. The flavour are mostly grapefruit and floral hops but there is a nice bready malt base. Overall it's an easy drinking IPA. The red ale was next up and it surprised me! The pour was as red as any beer I've ever seen and also had a hugely impressive head. The first aroma I smelled was not malty like I expected but quite hoppy with strong grapefruit and pine elements. As the beer warms the nose becomes a bit sweeter as caramel malts become more prominent. 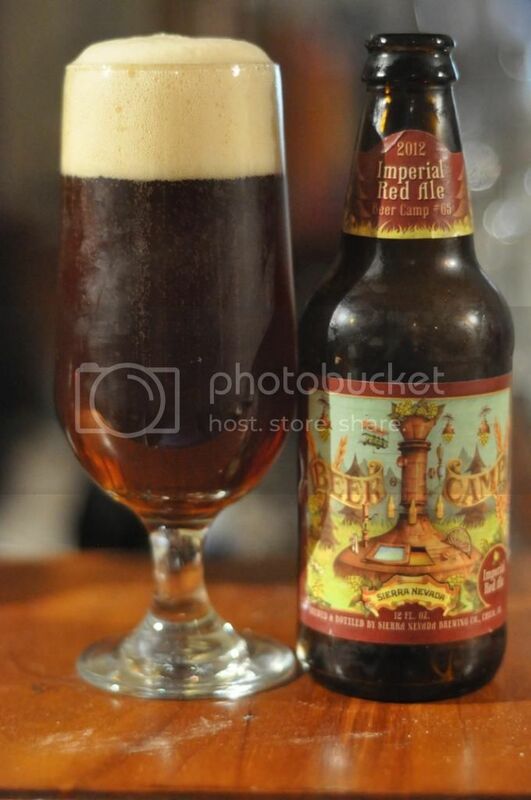 The Red Ale in Beer Camp 2012 is a seriously good beer! The hop bitterness is quite pronounced for a red ale but it is brilliantly balanced by some sweet caramel malts. The beer has some fruity qualities to it as well, I have a note on my phone saying peach but I honestly can't recall tasting that. The finish was quite dry and I could easily see myself drinking alot of these! 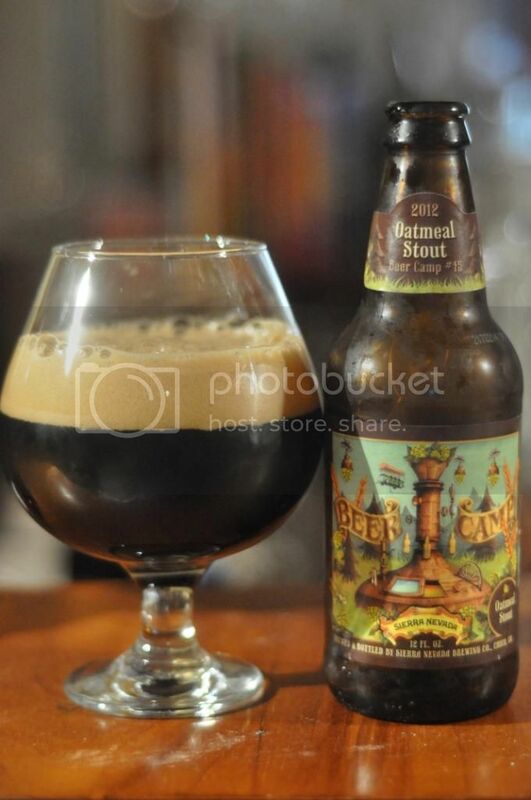 Last but not least we came to the Oatmeal Stout. When the beer was poured it seemed like the beer was quite viscous. The colour was definitely a dark brown not a black and the head was huge and creamy looking. The nose is mostly oatmeal but there is also plenty of other elements often found in stouts, such as coffee, chocolate and vanilla. There is also a good deal of roastyness. We were in a bit of a hurry by this point so had to drink it quite quickly. Normally this would be a bad thing to do with a stout but this one was beautiful and almost designed for drinking this way. The mouthfeel was amazingly smooth and creamy and the flavour was also something special. The roasted malts flavour was only moderate but every other element worked in perfect harmony to make an excellent stout. And now we come to the point where I try and sum Beer Camp 2012 up. Highlights for me included the texture and flavour of the Oatmeal Stout, which was just superb! The Imperial Pilsner was very refreshing and great for a hot day. While the only disappointment came from the Floral IPA, not because the beer was bad but because I was expecting more from a brewery which normally produces such great IPA's and this was just a little run of the mill. The most shocking thing for me though was the Red Ale. For me it was the pick of the bunch, nothing about it was bad. If you are only to try one of these beers make sure it's the Red Ale, you won't be disappointed!